Hendrik Johannes Cruijff (Amsterdam, 25 April 1947 – Barcelona, 24 March, 2016), known as Johan Cruyff, was a former Dutch footballer and coach. He won the Ballon d’Or three times, in 1971, 1973 and 1974 and he was the founder of the football philosophy known as Total Football. He is widely regarded as one of the great players in association football. In 1999, Cruyff was voted European Player of the Century. After his retirement as a player in 1984, Cruyff became highly successful as manager of Ajax and later FC Barcelona. 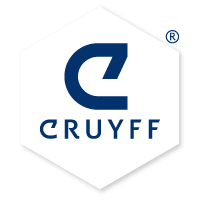 After his retirement from coaching he initiated the Cruyff Foundation, Cruyff Institute, Cruyff Classics, Cruyff Football and Cruyff Library. You can read about his personal accomplishments, Cruyff as a player and Cruyff as a trainer. Or have a look in the photo archives: Player, Trainer or Youth & Private.